Three years ago, Victoria Patience, Simon Berrill and Tim Gutteridge were looking for ways to improve the quality of our work. We realised we couldn’t afford to have each and every one of our texts professionally revised by another translator, so we decided that, instead of focusing on improving individual translations, we would focus on how to become better translators all round. There was only one small obstacle. Victoria lives in Buenos Aires, Simon’s home is in Barcelona and Tim is based in Cádiz, so whatever we did had to work remotely. The result was a collaborative professional development group, which goes by the name of Revision Club. We started simply by taking turns giving each other feedback on our work, sending back heavily annotated Word documents via email. But the arrangement quickly flourished and we now do a monthly translation slam (by Skype), we communicate regularly by email and WhatsApp, we share the occasional assignment, and we have presented our ideas at workshops and conferences. Our ScotNet summer workshop, presented by Simon and Tim, is designed to give participants a feel for how Revision Club works, and an insight into the many benefits it can offer, which range from clearing up those little niggly-naggly doubts about false friends and punctuation all the way up to life-coaching and superpowered professional networking. We have designed our workshop with multilingual groups in mind. Session 1 consists of a short presentation of how Revision Club works, followed by a discussion of what collaborative professional development involves, the key elements, and the potential benefits of such an arrangement. For session 2, participants will need to bring an example of one of their own translations, along with the corresponding source text, which will then provide the basis for working in pairs or small groups. For this activity, there will need to be at least one other participant working into the same TARGET language. For session 3, participants will need to complete a short translation, which will then provide the basis for working in pairs or small groups. For this activity, participants may be grouped either according to SOURCE or TARGET language depending on numbers, so as long as all participants work either into or out of English (which we’re assuming they do), there are no further participant requirements. Session 4 has two elements. During first 60 minutes, the presenters will do a translation slam using the same text as the one participants translated and discussed in session 3. The slam is designed to give participants a feel for how we conduct our monthly Skype slam and will be framed as wider discussion between the presenters and all of the workshop participants. The final 30 minutes of session 4 will provide an opportunity to discuss practical aspects of establishing, organising and maintaining a collaborative development partnership. For further information, including booking please contact ITI Scottish Network. Anyone who knows me or is familiar with my work will know that I am not a paid-up member of the literal translation school. I’m also (despite rumours to the contrary!) not a fan of picking over translations in search for what may either be minor errors or sensitive adjustments to carry the original into the target language. However, I worry that the understandable emphasis on producing a translation that is a thing of beauty in its own right can lead to translators depriving readers of some of what is most essential in the source text. Horas más tarde, ya bien entrada la noche, no podía dormir. Entré en el cuarto de María, me senté en una silla frente a su cama. Ella respiraba con dificultad por todos los cigarros que fumaba. La observé sin despertarla: la boca estaba entreabierta, las arrugas bordeaban sus ojos. Se ahogó pero luego volvió a respirar sin dificultad, por los movimientos continuos de sus labios. Se podía deducir que sus sueños eran violentos. Acerqué mi cara y sentí su respiración, el aire caliente que exhalaba. La saliva se escurrió por una de las comisuras y manchó la almohada. Había una fiesta en una de las casas del barrio. Las canciones llegaban apagadas hasta el dormitorio de María, hasta el dormitorio que muchos años atrás había sido de mi madre. Observé por la ventana los autos estacionados en la calle. Las risas de toda aquellla gente se mezclaron con las voces de los cantantes mexicanos de cumbias que siempre cantaban sobre amores no correspondidos, amores que acaban mal, amores perdidos. a description of physical phenomena that is at once very concrete and at the same time slightly abstract: as if the person experiencing them does so at one remove. HSeveral hours later, long after night had fallen,I couldn’t get to sleep. I went into María’s room and sat on a chair next to her bed.Her breathing was laborious because of all the cigarettes she smokedHerbreathing was laboured because of all the cigarettes she smoked. I watched her without waking herup: her mouth was slightly open,there were wrinkles all around her eyeswere surrounded by wrinkles. She choked, then began to breathe easily again[JIWP1] , and from the way her lips moved continuously, I could tell she was having disturbing dreams. I brought my face close to hers,let myself feelingher warm breathas she exhaled. Saliva dribbled from the corner of her mouth, leaving a damp patch on the pillow. There was a party in one of the neighbouring houses. The music was a muffled noise here, ofthe music could be heard in María’s bedroom, the bedroom that – many years before – had also[JIWP2] been my mother’s many years before. I looked out of the window,at the cars parked in the street outside. The laughter of the partygoers mixed with the voices singing Mexican cumbias[JIWP3] , telling as always of unrequited love, of love affairs that ended badly, of doomed love. [JIWP1]Not clear when she was breathing easily before. [JIWP2]Or by ‘also’, do you mean that they used to share the room? I take it the music is only muffled here, not where it is being played? [JIWP3]The voices of the partygoers or of other people? Are the songs or the voices ‘telling’? Is there any significance to Mexican music in a Bolivian novel? As you’ll see, Nat picked out a few bum notes in my translation, and also unfailingly put his finger on everything that sounded odd. (That’s exactly what I asked him to do – and I specifically told him not to worry about the source text or attempt to second-guess points where an unnatural phrasing might be justified by the source text.) He also had a few queries of the sort that will hopefully occur to the intelligent reader when they encounter an unusual or unfamiliar text. But this left me with a dilemma. Should I attend to these comments and adjust the translation to make it sound less ‘strange’, more ‘flowing’, more ‘natural’? Should I resolve some of the ambiguities? Should I ditch some strange phrasings in favour of more natural ones? Several hours later, well into the night, I couldn’t sleep. I went into María’s room, I sat on a chair next to her bed. Her breathing was laboured because of all the cigarettes she smoked. I watched without waking her up: her mouth was slightly open, wrinkles surrounded her eyes. She choked then began to breathe more easily again, from the way her lips moved continuously I could tell she was having disturbing dreams. I brought my face close to hers, feeling her warm breath as she exhaled. Saliva dribbled from the corner of her mouth, making a damp patch on the pillow. There was a party in one of the neighbouring houses. The muffled songs reached María’s bedroom, the bedroom that many years before had also been my mother’s. I looked out of the window at the cars parked in the street. The laughter of the partygoers mixed with the voices of the Mexican cumbia singers who always sang of unrequited love, love that ended badly, doomed love. In some places I simply took Nat’s advice on board, but generally his comments prompted me to look back at the source to see what was going on there. And as I did that, I realized there were a number of points where I’d drifted away from the source text in a desire to make my translation sound a bit more ‘natural’ but where I was, as a result, losing the style of the original. In each of these, I’ve replaced something more natural with something that it is more unusual. I wouldn’t die in a ditch for any of these translations, but cumulatively I’d argue that they are actually a better reflection of the style and feeling of the source text – or, to put it another way, choosing the more conventional options would in some sense betray the original. The following example involved slightly more extensive rewording but the principle is the same. The original was “las canciones llegaban apagadas” (literally, “the songs arrived muffled” – although there’s nothing particularly odd about the Spanish structure here). My initial draft was an attempt to find the most natural way to say this in English, while also avoiding a repetition of “song”, which appears in a later sentence. I think it’s not bad at all: a nice example, if you like, of not getting too hung up on the source language structure. However, I decided to cut it back for two reasons. Firstly, Barrientos’ style is quite laconic, and to capture it one really has to keep the English as concise as possible. Of course, sometimes a bit of expansion is inevitable – but in this case I think it is unnecessary. More importantly, though, my initial version refocuses the sentence, directing the reader’s attention towards the music, introducing an unspecified listener (who hears the music), and distracting the reader from the bedroom, which is actually the real focus of the sentence. So here, my ‘natural’ translation introduces a series of minor shifts which, taken together, significantly alter the focus and feel of the sentence. Again, I was quite pleased with my initial translation, and in one sense it’s more natural: it avoids repetition (“singing” + “telling” rather than “singers” + “sang”), the addition of “affairs” arguably helps to make “love [affairs] that ended badly” feel a little more at home in English, and adding “of” again helps to clarify that there are different kinds of “loves” (ones that are unrequited, ones that end badly, and ones that are doomed) not one single kind (which simultaneously is unrequited, ends badly and is doomed). But the cumulative impact of this is to rob the original of some of its feeling. There is a repetition of “canciones”, “cantantes” and “cantaban” in the original; if I replace this (as I did at first draft) with “noise”, “singers” and “telling” then the effect is lost. Now all of these might seem quite minor. Until we remember that this is a short paragraph in a full-length novel. The impact of applying all these naturalizing tweaks throughout the text would undoubtedly be to transform the style of the original (laconic, unusual, occasionally dissonant) into something much more ‘natural’ and flowing. And that brings me onto my main point. There is an understandable tendency among literary translators to stress the importance of target language writing skills, to argue that the translated text must stand on its own two feet, even – perhaps – to be somewhat dismissive of the whole issue of accuracy or fidelity. That’s all fine, but only up to a point. As translators, we also have a duty to the source text (obviously) and that duty must surely extend to seeking to find ways to carry the style of the source into the target language. But we can only do that if we attend very closely to the author’s specific choices, and at times that must mean that we should reject translations that are natural, flowing or simply ‘prettier’ in favour of ones that are not. Literary translation is not a beauty contest. Please contact me if you would like to see an extended sample of this translation. 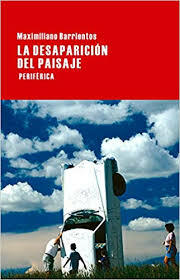 You can find out more about La desaparición del paisaje, and read an interview with the author here. Maximiliano Barrientos es autor de La desaparición del paisaje (Periférica, 2017). Hablé con el sobre su novela, la traducción y la literatura en general. TG: La desaparición del paisaje es uno de esos libros que parece sencillo: la historia de un hombre de 32 años, que vuelve a Bolivia después de 12 años en EE.UU. Pero cuando intento describirlo a amigos y compañeros me aturullo. Me doy cuenta de que, a pesar de ser relativamente corto (unas 270 páginas) y tener una trama más o menos sencilla, toca muchos temas. ¿Me lo puedes resumir en pocas palabras? MB: El más explícito de todos es el del regreso, lo que significa volver al lugar en el que sucedieron las experiencias importantes y también el lugar de donde el personaje huyó, ya que la novela parte de esa huida no narrada. Hay una problemática en todo regreso porque uno vuelve al espacio físico pero no al espacio mental, emocional, donde sucedieron esas cosas. Uno vuelve al lugar, pero no al pasado (este aparece todo el tiempo como un espectro). Por lo tanto, el pasado es otro de los temas importantes de la novela. El tercer gran tema, a mi parecer, es la familia, especialmente la relación entre padres e hijos, y la lucha que los hijos emprenden cuando se ven amenazados por los demonios de los padres. En esa lucha creo que se aborda la construcción de la masculinidad, de cierto tipo de masculinidad, que procesa la pérdida desde la rabia y desde la violencia. TG: Una de las cosas que me encanta cuando me pongo a traducir un texto -que en este caso solo consiste en una muestra hasta ahora- es que me obliga a leer con mucha atención. Confieso que no soy un lector particularmente atento por naturaleza (¡dicho de otra manera, soy vago! ), pero cuando empiezo a traducir me fijo en todo: la puntuación, las ambigüedades, los pequeños silencios, el ritmo de los diálogos. Es como si, por arte de magia, me hubiera convertido de repente en una especie de lector superdotado. Al traducir las primeras 15 páginas de La desaparición del paisaje, me di cuenta de que tu estilo -que a primera vista parece sencilla- también es bastante idiosincrático. ¿Me puedes comentar como concibes tu estilo, en qué consiste? MB: Concuerdo. Es interesante como traducir nos obliga a ser lectores puntillosos, yo he tenido una experiencia muy discreta y totalmente amateur traduciendo algunos cuentos de autores como Peter Orner, Aimee Bender, Mary Gaitskill y Rick Bass para un taller de creación literaria que imparto desde hace algunos años. 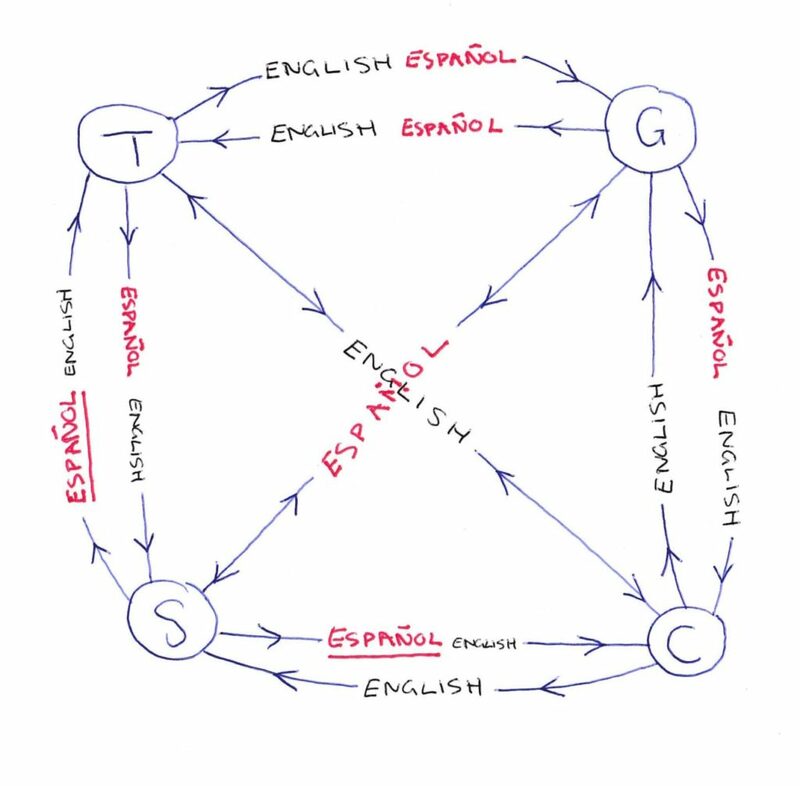 Como quería comentar algunas cuestiones estructurales de ciertos relatos, y como no había traducción al español, yo les pasaba el original y adjuntaba la traducción que había hecho. Creo que el estilo no se escoge, siguiendo a la gran Flannery O’Connor, es un don, algo innato, con lo que uno se topa en algún momento después de innumerables fracasos, después de innumerables lecturas en las que intuyes lugares por los que no querés irte como narrador. Ayuda más al estilo descubrir qué cosas detestas en ciertos escritores que descubrir qué cosas adoras. La educación literaria es un campo de batalla en el que hay que tomar partido por un bando o por otro, no hay neutralidad. El estilo es un descubrimiento, pero sin el aprendizaje del oficio queda amorfo. Se lo potencia con el oficio, y supongo que ese es el aprendizaje del escritor. A mí me interesa que el lenguaje produzca la ilusión de la experiencia, induzca una vivencia en el lector, y para ello tiene que invisibilizarse y convertirse en una cadencia, en un ritmo, en una respiración que esté al servicio de ciertas imágenes claves. Lo primero y más importante para mí es la imagen: el lenguaje trata de traducirla. TG: Que yo sepa, antes de leer La desaparición del paisaje solo había leído una novela boliviana en mi vida: Los afectos, de Rodrigo Hasbún (traducido al inglés con el título Affections, por Sophie Hughes y publicado por Pushkin Press). ¿Te sitúas dentro de una tradición literaria boliviana, o más bien dentro de algo más amplio: la literatura latinoamericana o incluso en lengua española, sencillamente? ¿Hay algún escritor en particular que ha tenido mucha influencia en tu trayecto como autor? MB: Creo que es difícil hablar de una tradición boliviana o latinoamericana ya que bajo esa etiqueta se asocian a escritores que no tienen nada que ver entre sí, que tienen poéticas muy distintas, contrapuestas. Yo me siento en deuda con ciertos escritores bolivianos, latinoamericanos, norteamericanos y europeos. Si tuviera que hacer algo así como una tradición, las puntas de lanzas serían poetas como Jaime Saenz, Viel Temperley y Zbigniew Herbert. Novelistas como William Faulkner, J.G. Ballard, Vladimir Sorokin, Cormac McCarthy y Juan José Saer. Cuentistas como Raymond Carver, Denis Johnson y Mariana Enríquez. El concepto de tradición estrictamente literario no puede mapearse por territorios sino por afinidades con el imaginario y con la sensibilidad, y por lo tanto no hablamos de estructuras sólidas sino de estructuras movedizas. Un escritor no siempre pertenece a un mismo linaje: se producen rupturas en el tiempo. Si lo pensamos desde una perspectiva territorial, la tradición funciona más en términos de lobby. Si un escritor mexicano o argentino publica una novela la tendrá mil veces más fácil que uno ecuatoriano o boliviano, eso por el mismo sistema de producción, por la misma infraestructura. ¿Se aborda con la misma expectativa una novela escrita por un paraguayo que una escrita por un colombiano? Sería absurdo pensar que sí. Todo el sistema está montado para favorecer a las tradiciones fuertes. Este es el texto original de la conversación que mantuve con Maximiliano por email. Figura en inglés en este artículo, que ofrece una reseña La desaparición del paisaje, acompañada por una traducción de las primeras 12 páginas de la novela. Y aquí escribo sobre el reto que supone intentar captar el estilo de Maximiliano Barrientos al traducirlo al inglés. 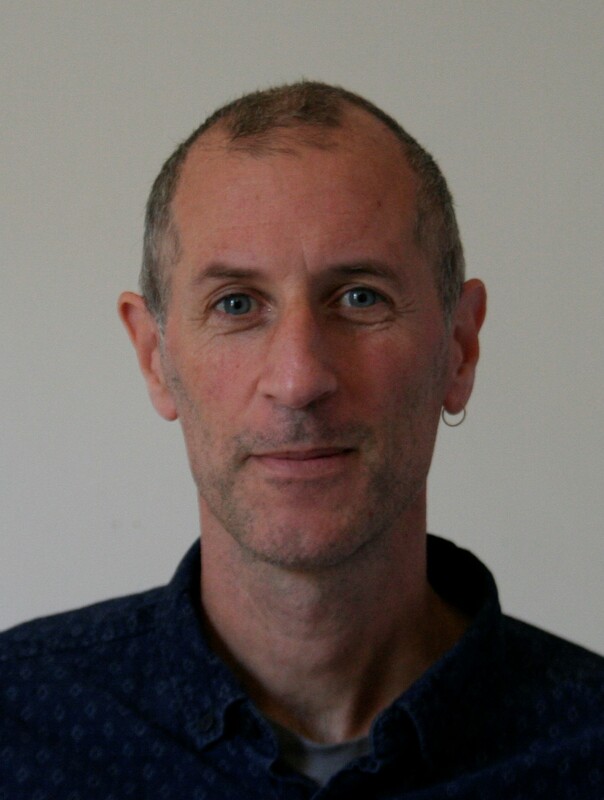 During the course of this year, I’ve blogged on a range of topics, including translation criticism, collaborative development, theatre translation and client queries. But always, when writing, I’ve had in my mind former translation students from Heriot-Watt University in Edinburgh. Although I only taught there for three years, that experience made a huge impact on me, and much of my subsequent writing and collaboration with colleagues is to some degree an attempt to fill the gap that was created when I moved to Cadiz in the south of Spain (which would have made for a rather long commute). Another inescapable feature of my year in blogging has been Tim Parks. Whenever I’ve talked about translation criticism in particular, his name has cropped up. In fact, sometimes one gets the impression from fellow translators that all Tim Parks does is criticize other people’s translations. I know that’s not true. He also praises them, writes about the business of literary translation in general and reviews both fiction and non-fiction, translated and otherwise. He writes novels and non-fiction of his own. And, of course, he’s translated some of the biggest names in Italian literature: Calvino, Moravia, Leopardi, Machiavelli and, right now, Pavese. 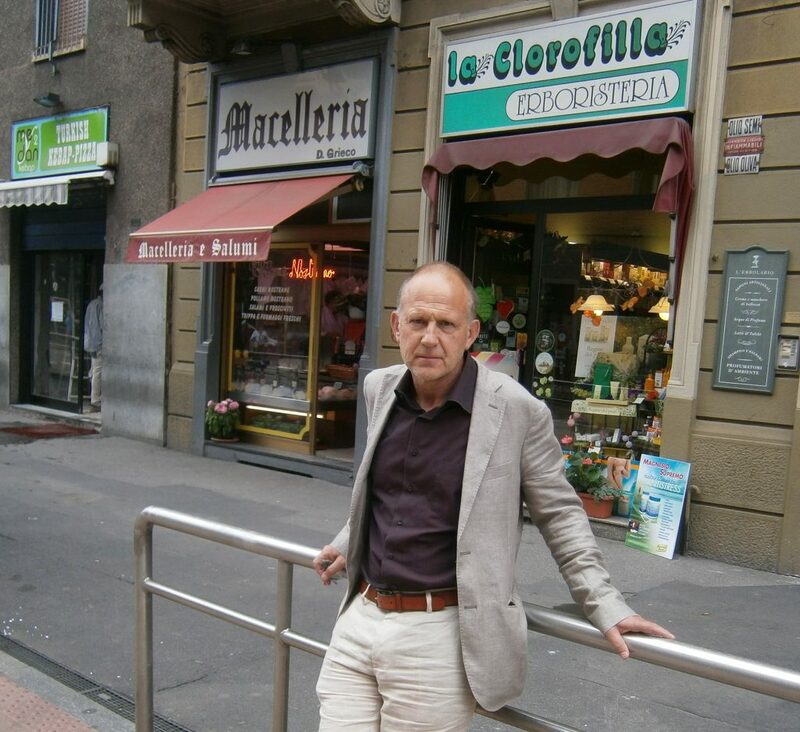 He teaches at IULM University of Milan, and I see that in January he’s going to be teaching a new ‘check-up’ course, whatever that might mean, for translators in Florence. TG: In your writing about translation, it’s obvious that you set great store by a close reading of the source text, one that pays attention to register, style and nuance. How much of this, I wonder, can be taught? TP: Well, I wonder that too, just as I always wonder how much one can teach a person to write in a creative writing class. What you can do is invite people to read texts more carefully, with method, being aware of the kinds of pleasure they give the reader and how they deliver them. I’ve always felt it was crucial when translating to have a strong sense of why the work you’re translating is good, why it makes sense that someone wants this in my language. Over twenty and more years of doing this with students in Milan, I’ve noticed that some get the point and learn rapidly, others slowly, others not at all. So although close reading is only a starting point, I think at least that can be fostered in a class. Of course then there’s the problem of how the reading you’ve done is going to drive the writing you have to do when you actually start translating. TG: I’m intrigued by how that works in practice. Let’s take a concrete example. I’m assuming one of the things you ask your students to do is to translate extracts from novels. Do you talk about the source text independently, requiring students to read the whole book first? Or do you jump straight into the translation but then discuss it, and the challenges it poses, in relation to a close reading of the text? In other words, what is the relationship between reading the source text and writing the translation? TP: In the second year course I’m teaching now in Milan, second year postgrad that is, I’m alternating between genre and ‘serious’ fiction. We start with chick lit, since after they graduate this is the kind of thing young translators in Milan get asked to do. We read the opening pages of the book we’re looking at. We think about the genre and how it works, above all the relationship of complicity it sets up between narrative voice and reader, the kind of humour, how local or otherwise it is. We translate a page or so and discuss the various versions. Then we look at the first pages of three or four famous chick lit books (on PowerPoint) and see how they’ve been translated and what the publishers want, what the criteria seem to be when it comes to choices about realia and idioms and so on. Then we translate a bit more of our book and go back over what we’ve already done. Each week they do a bit more and send it to me for homework. I put all their versions side by side and send them back to all of them. So they can all see what the others are doing and how I reacted. So they get used to criticism, my famous criticism. I put examples up on a PowerPoint of different versions. And so on. In general, we have fun. After about a month, that is four or five lessons (three hours each), we shift to a different book, this time literature, but literature dealing with the same issues as the genre fiction. For example, after the chick lit, we look at Letty Fox, Her Luck by the wonderful Christina Stead about a young woman in New York in the late 1940s. Again the same process. But with the added intrigue now of establishing the differ­ence between this and the chick lit: above all, Stead’s far more sophisticated use of irony, far more complex relationship with the reader. We look at a published trans­lation after we’ve done our own version, and think about whether it is as good as it could have been. And the student begins to sense, or some of them do, how their writing strategy has to adapt to the nature of the text they’re working from. For example, maybe they’ve really enjoyed getting the voice of the chick lit, finding the right colloquialisms in their Italian, the right feel, then they try to do the same thing with Christina Stead and it just muddies the waters. It’s still a colloquial voice, but the register and the relationship with the reader is quite different. It’s a different aesthetic. So they have to think again. TG: I’m going to come back to some of that in a moment. But before we get onto the issue of how students (or any translators) put things into their target language, I’d like to probe you about the role of the source language. My Spanish is pretty good. I’m not fully bilingual but I occasionally ‘pass’ and I’m generally very comfortable in the language. Even so, I’d say that some of the things you mention here – narrative voice, humour, irony, register – are the trickiest things to pick up. (Even native speakers sometime miss them.) How do you address that in your teaching? Obviously you can explain these things for texts you’re working on in class, but you won’t be able to hold students’ hands once they graduate. TP: Going right back as far as St Jerome or Roger Bacon or Leonardo Bruni, commentators on translation have always pointed out the problem posed by the need for deep competence in the source language. You think you know the language, but you don’t. There are things you’re missing. And yes, of course, even in our native language we miss things; literature is so much less important in our culture now that many readers are only competent up to a point. For sure I can’t give my students in seventy hours of lessons the English they need to translate well. But I can show them some exciting text, let’s say the opening of Middlemarch, and look at a few Italian translations. And they can see who’s got what, who’s missing what and where they’re trying to place the work in the Italian literary context. And they’re alerted to the immense and wonderful problem of language complexity, which is what makes literature so exciting, of course, its depth, subtlety, nuance. Once alerted, it’s up to them. Some of them will run with it, and grow much more aware, learn what they need to learn, others will be daunted. Thinking back on my own years in Italy, nearly forty now, I’m aware of how little at the beginning I really felt or grasped the tone of this or that. Translation is something you grow into. TP: I hear you. Young people come out of a first degree, do a Masters in translation, hoping to work in the field, and the universities hit them with ‘translation studies’, much of it interesting but a lot of it mere ideology, and very little of it practical. Perhaps this is because they have students from many different countries and it’s hard to work with all of them on the same translation, from this language to that. Plus there’s the fact that it takes a long time to work through your students’ homework. For years I had both first- and second-year classes (all Italian students) and was correcting – yes I’m going to use that word – and giving feedback on around fifty students’ work over the weekend. But it’s the only way. And it’s important that they see the other students’ work too, and what I said about it. Because that way they begin to see how other people translate in different ways, how each of us has a sort of signature in the way we translate. They understand each others’ strengths and weaknesses. With students obsessively close to the structure of the original, I’ll be suggesting they experiment with something more flexible; with students who love to change everything, I’ll be inviting them to make sure they’ve said exactly what the source text said, and so on. I should say that this degree also has courses in technical and commercial translation. So the students work with a wide range of texts. And this is crucial. It’s a mistake to focus entirely on the literary, at least at the beginning. You want to be exposed to the language across the board. Certainly, the ten or so years when I was translating everything from fashion shoe promos to diesel filter manuals was incredibly useful to me. TG: Going back to the issue of close reading… Particularly among literary translators, it’s commonplace to hear people saying “it’s the ability to write in your target language that really matters” or something along those lines. When you teach translation, do you also see yourself as a ‘creative writing’ teacher in any sense? TP: A translator has the task of reading a foreign text for the home audience and delivering to them what he or she has read. Not creating something ex nihilo. So the creativity of the translator’s writing is not in finding anything new, but in finding a way of getting that original text to happen in the target language. As we all know, when translating, the biggest obstacle to writing well (Luther said this wonderfully) is the syntax, structure and lexical segmentation of the other language. We know that the text won’t go ‘straight’ into our own language. So we have our work cut out. On the other hand, everything we decide to put down, we should do so with our experience of the original in mind. That’s our job. My impression is that many translators write poorly because they haven’t really grasped what the original is saying, or how it is saying it. It’s not easy to write if you don’t know quite what you’re supposed to be doing, if you’re filling in, papering across the cracks in your knowledge. This was the burden of my famous, perhaps infamous, article on Stuart Woolf and Ann Goldstein’s translations of Primo Levi. Because they didn’t really grasp the idiomatic nature of what they were translating, they were writing poorly too. Once you’ve really understood, it might not be easy to get the text into English, but it’s a lot easier. At least you know what you’re doing. And that’s the kind of writing I’m trying to teach. Let’s focus on what the original deeply means, and the flavour of how it was said, and let’s experiment with different ways of having that come out in our language. Above all let’s avoid adopting a style that we think suits our publisher and our market, regardless of what’s actually in the original. This is all too common today and makes a mockery of the pieties of bringing cultures together. TG: You probably know from my blog and elsewhere that I’m passionate about collaborative arrangements, with translators critiquing each other’s work, sharing ideas, getting together for workshops and so on. Some of the benefits of that are obvious: you receive constructive input that helps you to improve your translations and hone your skills. But there are also other less obvious benefits. I actually learn a lot from reviewing my colleagues’ work, not just because I’m lucky to work with some very talented translators but also because the whole process of thinking about what does and doesn’t work in someone else’s translations gives you a different perspective. Do you have any thoughts about the less immediate benefits of translation teaching, both for students and for teachers? TP: For sure it’s good to have a few people you can rely on when you run into trouble with a translation, and you can always learn from looking at other people’s work and seeing what they’re up to. I’ve learned an immense amount from teaching; partly from the need to analyse the texts when I’m preparing lessons – that’s where the book Translating Style came from after all – but also from the students themselves, who often see stuff I’ve missed, and who naturally write far better Italian than I do. Which is chastening! One problem with seeking help from others, though, particularly when you’re translating a difficult author, is that you can’t expect the other person to be as deeply into the text as you are, and you can end up losing evenness of style if you start accepting suggestions left, right and centre. In this sense it’s a good idea to distinguish between class­room or workshop situations where you’re learning and a situation where you have a serious job to do and you have to be the expert yourself. It’s hard, for example, to ask for help trans­lating Pavese because his style is so strange, so knotty and allusive, that people who don’t know it really can’t help. Then there’s a great difference between collaborating with native speakers of the language you work from and collaborating with native speakers of your own language. I’m used to teaching Italians, but I must say I’m rather excited to see what’s going to happen with this new course in Florence, where I’ll be working with professional translators into English. Hopefully, I’ll have much to give, but also lots to learn. One’s never too old to learn a new trick or two. And it’s only fresh learning that keeps you excited about your work. This morning, the first thing I saw on Twitter was a new prize for emerging translators. It was being organized by well-regarded indie publisher, Peirene Press and you can find all the details here. In summary, the prize is open to previously unpublished translators (defined as those who have never had a full work of translated fiction published). You need to translate the first chapter of an Italian novel. The prize is worth £3,500, and your translation of the whole novel will be published by Peirene Press. But let’s think about this. What they’re really saying is that the prize is a fee for performing a piece of professional work. So literary translation is no longer something that you are paid to do, but rather something that, if you are lucky enough, someone rewards with a cash prize. Or, in plain English, the entry fee consists of a subscription to Peirene Press, and we (Peirene Press) think it is important that we (Peirene Press) get something extra out of the prize, namely, additional subscribers. And then it gets weird. Entrants must attend an obligatory writer’s retreat in the Pyrenees (no travel expenses available, although the wording on the Peirene website suggests that they think the Pyrenees are in the UK!) and there are no details of whether the retreat involves any editorial input. Apart from just feeling a bit bossy and pointless, this excludes potential entrants with commitments (family, work or whatever) , other circumstances (e.g., physical disability) or just personal preferences that might prevent them from going on the retreat. When I commented on the prize on Twitter, someone from Peirene replied that their initiative was intended as “a celebration of translation” (preceded by the inevitable “I’m sorry you feel this way…”). not forcing translators to go on ill-defined writers’ retreats as one of the conditions for performing our work? 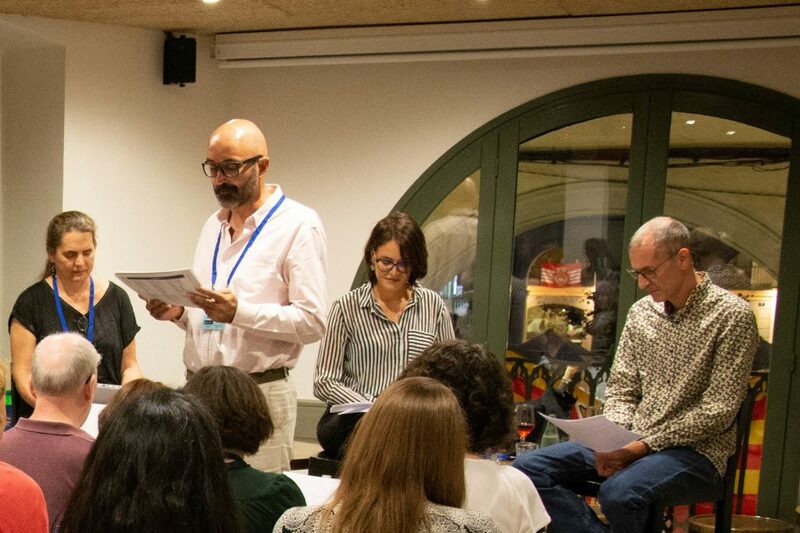 I took part in a translation slam with Maeva Cifuentes as part of the Mediterranean Editors and Translators Meeting 2018 in Girona on 4 October 2018. 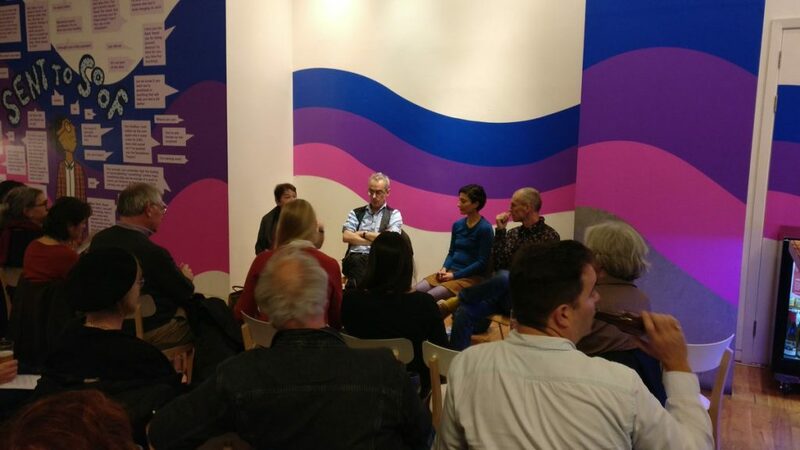 For anyone who is unfamiliar with the concept of a translation slam, the format is generally as follows: two translators present their translations of the same text, in front of an audience, and discuss the challenges of the translation, pinpointing similarities and differences, explaining the reasons for their choices and perhaps also recognising points where, in hindsight, they might have done things differently. It’s perhaps best to think of it not so much as a competition or ‘duel’ (the other term sometimes used) but rather as an opportunity to put the translation process on show and explore in public how the same text can give rise to two different translations. I’ve been to a few slams in my time, both under the auspices of specific literary translation gatherings and for more general audiences at book festivals, and I was particularly happy with the way our slam went in Girona. Audience participation. This might seem surprising as a second choice, but for a slam to really come to life, you need an audience that is engaged – and is willing to really question the translators’ choices. We couldn’t have asked for a better audience at Girona. 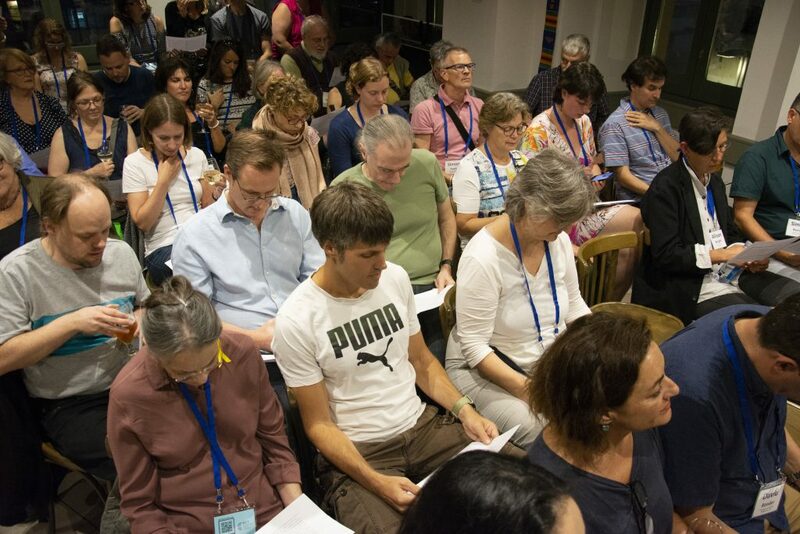 Fifty colleagues – bringing to bear their experience as translators from different languages and in different fields, and also drawing on their personal backgrounds, and their readings of the text. The last thing I’d want, as a slammer, would be deference or polite appreciation. What I want is people contesting my choices, offering improvements of their own, and getting their teeth into the problems of accuracy, voice, coherence and all the rest of it. That was exactly what the METM crowd gave us. Moderation. I’d never really thought about this before, but taking part in the slam made me realise just how important the moderator’s role is. You need to be gentle yet firm, making sure that the translators get a chance to explain their choices, bringing the audience into the conversation – and teasing out anything important that you think has been missed. And you need to communicate your own enthusiasm for the source text and for the translation process. I would take my hat off to Kymm, but I’ve already done that above, and we translators hate repetition, so I shall remove my headgear instead. Translators. So what do the actual slammers bring to the party? Well, to start with you have to have the guts to put your work up for discussion (in this case, for an audience of peers, many of whom were inevitably far more experienced than either of us). Beyond that, the slam participants need to take a distinctive approach to the text – one that goes beyond ‘correctly’ translating individual sentences and instead provides a coherent interpretation of the source text, told in a distinctive voice. You need to be prepared to explain and defend your choices, but also to identify points where you feel you may have slipped or where other options – either from your fellow slammer or from the audience – might constitute improvements. And you need to be able to communicate your love of translation – the joys, the frustrations, the ambiguities, the beauty – to anyone who is prepared to listen. I hope that’s what my co-slammer Maeva Cifuentes and I managed to do. If I was any good at that, it’s only because I’ve had a year’s worth of training from my colleagues Victoria Patience and Simon Berrill, with whom I’ve been doing a monthly slam via Skype as part of our ongoing collaborative professional development partnership. The support team. An event like this doesn’t happen on its own. You need a venue, publicity, coordination and printouts, to name just a few factors. Unsurprisingly, the team at MET – who put together fantastic annual conferences and organise a programme of events throughout the year – did a great job. Well done Aisha Prigann, Helen Oclee-Brown and Kelly Dickeson, among others. The following piece was written as the introduction to the bilingual edition of La Golondrina/The Swallow (Guillem Clua), published by Ediciones Antigona. 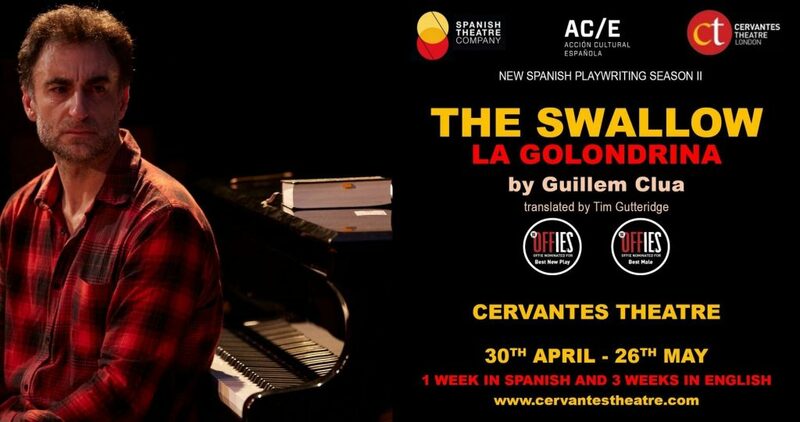 The English version of the play is on at the Cervantes Theatre, London, from 8 to 26 May, 2018. If you compare the original Spanish text of La Golondrina with its English translation, The Swallow, the first thing you’ll notice is that the protagonists of La Golondrina are called Ramón and Amelia, while their counterparts in the English version are Ray and Emily. But their names are not the only thing about them that is different: Ray and Emily don’t just speak English, they are English. That might seem obvious. What else could they be? Well, they could be American or Scottish, for a start. But they aren’t. Or they could be Spanish – after all, when we watch Lorca’s House of Bernarda Alba, we don’t have a problem with the notion that its Spanish characters are speaking English. Or they could be from anywhere and nowhere, like the tramps in Waiting for Godot (En attendant Godot in its original, French version). So why did I transfer the action of La Golondrina from Spain to England, and what effect did this have on the translation? The first thing to realise is that La Golondrina itself is based on action that has been transferred. In this case, a real world event – an attack on a gay nightclub in which those who died were the victims not just of a terrorist atrocity but of a homophobic hate crime – is relocated from Florida, USA, to an unspecified provincial Spanish city. In a sense, then, the original play has two locations: it is set in Spain but also in the USA. And the effect of this shift, paradoxically, is to emphasise the universal nature of the themes explored in the play (homophobia, gay love, mother–son relationships, misunderstandings, truth and lies), because the action is at once anchored in the local setting and refers to an international event. If you transfer this play to the London stage, then, it makes sense to replace the ‘local’ setting of the original script with the local setting of the English-language production. What impact does this decision have on the translation? We’ve already seen perhaps the most obvious effect: the protagonists’ names are changed. But the decision to relocate a play, once taken, ripples all the way through the translation. Potentially, it influences every single line of the text. Here, I will identify a few of these changes. Despite its universal feel, La Golondrina contains plenty of references to Spanish culture. Where possible, I adapted these to make them feel more ‘British’. Amelia cooks paella and cannelloni for her son, while Emily prepares roast chicken and spaghetti bolognaise; Amelia refers to watching an episode of Masterchef, while Emily watches Great British Bake-Off; Amelia and her son dance at a Verbena (a traditional Spanish open-air festival to celebrate a local holiday), while Emily and her son attend a Summer Fair, and so on. Some of the references are more subtle. When Ramón reveals that he studied translation and interpreting before completing a master’s or two, I decided that Ray would have a degree in Spanish. I didn’t have to change his qualification, but sticking with the original had a distractingly technical ring in English. The modification also allowed me to acknowledge the Spanish origins of the text and – perhaps most importantly of all – by introducing the idea that Ray was familiar with Spanish culture, it helped me to keep one cultural reference that I had no intention of changing, an issue to which I will return at the end. Some of these differences are reasonably easy to identify. When Ramón refers to the bar as el bar de moda (literally, the fashionable bar), Ray calls it the ‘in’ place. And I deliberately opted for contractions (it’s, I’m etc.) and colloquial words and phrases – wad of cash (rather than bundle of notes), telly (and not just TV or television) – wherever possible. Less immediately noticeable, perhaps, but arguably more important is the effort to ensure that the translation doesn’t bear the scars of the source language. For example, Ramón and Amelia use the word sí nineteen times in the original script. In the translation, the equivalent word – yes – appears a mere three times. Near the start of the play, when Ramón asks Amelia if she knows the play’s title song La Golondrina, Amelia answers Me es familiar, sí. (I’m familiar with it, yes.) But when Emily is asked the same question by Ray, she simply replies I’m familiar with it. I could have kept the yes or perhaps moved it to the start of the sentence, but it felt far more natural in English to omit it altogether. And on the subject of omissions, although I changed Amelia to Emily, you wouldn’t know unless you read the programme or the script. In the original play, Ramón addresses Amelia by name no fewer than twelve times. In the English version, Ray doesn’t use Emily’s name once. Why? Because Spanish allows Ramón to protect himself against the charge of over-familiarity by prefacing the first name with Señora. I could have had Ray address his boyfriend’s mother as Mrs Emily but it would have sounded rather stilted. The more natural choice, particularly in a one-to-one dialogue, was to drop the name altogether. I’ve talked so far about some of the many ways in which the decision to relocate the action from Spain to England influenced my translation. However, the play is still very identifiably the same: almost every line in the English matches an equivalent line in the Spanish text, in effect if not in literal meaning. And there is also one key cultural reference that remains unchanged in both versions. Without giving too much away, a key moment in the play revolves around a volume of poetry that Ramón/Ray has given to his boyfriend Dani/Danny, some years earlier. The book is by Federico García Lorca. But Lorca is there not simply as a cultural reference point to anchor the action in Spain but also because of how he lived and how he died: a gay poet and playwright who was unable to declare his sexuality in public, he was assassinated by right-wing nationalists in the wake of the military coup that brought General Franco to power in 1936. He was, in other words, the victim not just of a political assassination but of a homophobic hate crime.